There's just too much goodness that I want to share with you guys from our trip to Marfa, so in an attempt to avoid (completely) photographic overload, I'm going to split my "scenes" up into two posts... I'll share some of the highlights of our trip today, and, since several of you have asked for tips on visiting Marfa, I thought I'd include a little "stay/eat/do" guide with tomorrow's photo extravaganza in gratitude for indulging me. I realize it's a bit simplistic and obvious to characterize Marfa as "magical", but really in every sense of the term, it is pure magic. It's this shimmering little mirage in the middle of majestic West Texas...all high art and good food and interesting, smart, creative people tucked quietly amidst beautifully broken-down buildings and eerily empty roads. Being there is restorative and inspiring and inevitably prompts every person I've known who's visited to dream of packing-up and reinventing themselves in that seemingly limitless landscape. Our trip consisted of mostly ambling about... We spent a lot of time with our dear friends Buck and Camp at their amazing house, ate some excellent meals (the restaurants are few but stellar), visited Chinati and marveled over the Flavins and the foresight of Donald Judd, swam in bracingly cold spring-fed pools at Balmoreha State Park (and were in awe of the crazy "finger mountains" on our drive there that the girlies likened to "drip castles made by God") and rode our bikes everywhere. But most important, in this space, they could be kids -- a state that has become far too rare. 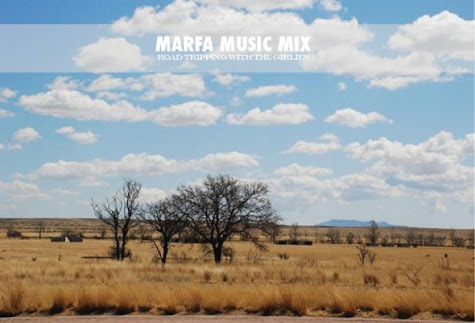 Beautiful trip - I would love to go to Marfa. Looking forward to your guide tomorrow! these photos looks so dreamy, i cant wait to see the rest! gorgeous inspired pics. looks like fun! I need, I want, I have to go to Marfa. my brother worked for the judd foundation in marfa all summer was completely in love with it. while he first called home saying he needed to do something to up his cowboy cred (i pointed out that his first concert was kenny rogers and that should do something? ), he managed to survive the summer as a vegan artist, eschewing all honest-cowboy-roots and making it totally on his own. that says a lot about marfa to me. that, and i'm pretty sure it's the *only* place besides ATX you could be a vegan in texas. Hey! It makes me miss you. Come back all ready! I think our yard guy is slacking. Looks like an amazing trip, now you've seriously fueled my desire to get down there. I can't wait to see part two. Thanks again for putting together such a great mix. Been dying to go to Marfa since I first read about it years ago. Seems very cool and laidback. Also love the dress you're (i assume it's you!) wearing in the 5th shot with the clogs - beautiful! Looks like a great trip, and I love the music mix! It has quite a few of my current faves.